Torino welcomed Atalanta to Stadio Olimpico – Grande Torino in Turin on Saturday night in a game which certainly won’t go to the history as a classic. Still, there were some interesting tactical developments in the game starting with the way both teams defended. As always, Atalanta’s shape can hardly be described like that as they always adapt their shape after the opposition due to their collective man-marking style. In attack it mostly looked like that though, albeit Gomez playing really wide on the left with Petagna in the centre and Kurtic just behind him with the right wing left to Hateboer. As mentioned, and further discussed in this team analysis of Atalanta last year, Gasperini deploys a collective man-marking scheme which sees his players mark their direct opponent, often regardless of where they move. Granted, the Atalanta players hand over players to each other when needed but mostly they stick to their direct opponent as few teams have players who freely move around the pitch. However, as we’ll see, Adem Ljajic could cause Atalanta because of that very reason. Torino’s 4-3-3 made it perfect for Atalanta’s normal setup to deploy their man-marking. First off, the two strikers Petagna and Gomez marked Toro’s centre-backs. The attacking midfielder Kurtic then marked Toro’s defensive midfielder Rincon. Swiftly, Atalanta had removed Torino’s three central options when trying to build attacks. Torino’s full-backs were left alone with Atalanta inviting lofted pass into them from the goalkeeper Sirigu with Hateboer and Spinazzola ready to sprint into pressure as soon as the ball left the goalkeepers foot. In midfield, Cristante and Freuler marked Baselli and Obi as you’d expect while the back-three marked the front three of Torino, albeit not as tightly as in midfield. When the ball was on Atalanta’s left, Masiello would stick tight to Falque, Caldara tight to Belotti while the ball-far centre-back Toloi would become an extra man and leave Ljajic free until the ball switched over. Below is two images of Atalanta’s man-marking scheme. Here we see how Atalanta immediately stop Sirigu’s central options and invites the lofted pass into the right-back De Silvestri. And here we have an overview of the entire collective man-marking scheme. I’ve highlighted the physical battle between Caldara and Belotti at the back which was entertaining in itself and Masiello in the centre-circle. Masiello is the left-sided centre-back for Atalanta and has followed Falque into midfield despite the fact there’s no way Sirigu could find Falque with a pass. If Atalanta’s clear man-orientations were unsurprising, Torino surprised slightly with their high-pressing. They too forced their opponent into long balls from the goalkeeper by man-marking Atalanta’s back-three and two central midfielders which disrupted Atalanta’s normally effective build up play. The formations of both sides made it perfect for Torino to press that way with the front three going toe to toe with Atalanta’s back-three while Baselli and Obi marked Freuler and Cristante in midfield. Below is an example of this setup. It can’t be seen in this image but Obi marks Cristante but is just out of shot. And another example. Belotti uses his cover shadow to block any pass to Caldara. Berisha is forced long. Obviously, the pressing of both sides had it’s effects on the game. Without exaggerating, the first half might be one of the technically worst in recent years in Italy. At times the game represented a contest between Sirigu and Berisha to see who had the better long kicks. Neither came out on top as most of them went straight to the opposition or out of bounds. The technical quality of the game suffered and neither side could muster any maintained periods of passing. Counter-attacks therefore became important, but apart from a Gomez shot, an Obi cross that crept past everybody in the box and a Ljajic shot straight at Berisha after the Serbian weaved his way past three defenders we didn’t have any other chances in the first half. Until stoppage time that was, when N’Koulou headed a Ljajic corner into the net. It’s hard to say either side deserved a lead, but Torino had done more and were really aggressive, as exampled by this image below when four Torino players counter-press just outside Atalanta’s box to win the ball back and create Obi’s chance. The only times in the first half Torino managed to overcome Atalanta’s press were when Adem Ljajic used his freedom to find space in midfield which gave Torino a 4 vs 3 against Atalanta. Ljajic moved away from his marker, mostly Toloi, to sometimes end up just in front of his own defense. This meant he could overload the midfield area for Torino. Atalanta couldn’t alter their approach quickly enough which meant the Serbian could create a few openings. One of them was for Obi’s cross which was nearly converted by Belotti or Falque. In the image below, Ljajic has dropped into midfield and finds some empty space as his closest opponents are busy with marking other Torino players. The free space sees Ljajic initiate an attack from deep. 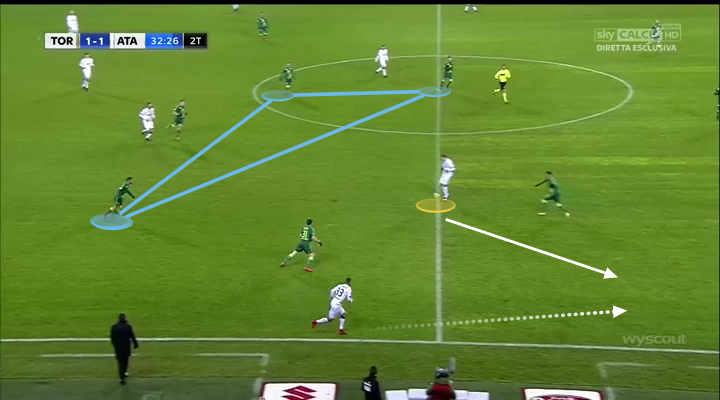 Ljajic consistently moved towards the centre or sometimes even over on the right wing. When he moved centrally, Obi would sometimes balance his positioning by moving wider on the left. On one of these occasions, the duo created the cross I’ve mentioned. I’m not sure this is something Mihajlovic has worked on or if it’s just intelligent movement from the Nigerian to balance up the inverted movement of the left winger Ljajic. Here we see Ljajic in a central role while Obi has moved left. If the ball had gone left here, Obi and left-back Ansaldi could have doubled up on the right wing-back Hateboer, but Ljajic tried to combine centrally. The balancing movement helped Torino surprise Atalanta in the centre and cause a bit of confusion at times in an otherwise rigid first half. If it took one Balkan magician to unlock Atalanta’s defence in the first half, it needed another to unlock Torino’s defence in the second. Josip Ilicic replaced fellow Slovenian Jasmin Kurtic at half time and took his position as the attacking midfielder in Atalanta’s setup. The difference was where he positioned himself; Kurtic had usually stayed centrally, quite close to where Rincon was comfortable defending, he had been easily dealt with. Gasperini told Ilicic to stay around the right half-space from where he would find space to hurt Torino. In the image below we see how he finds space in the right half-space and escapes Torino’s midfield who are all watching the ball. As the pass comes towards Ilicic, left-back substitute Antonio Barreca is forced to move inside to press him which opens up the right wing for Hateboer. A simple pass into the path of the Dutchman and Atalanta attack 3 vs 3. 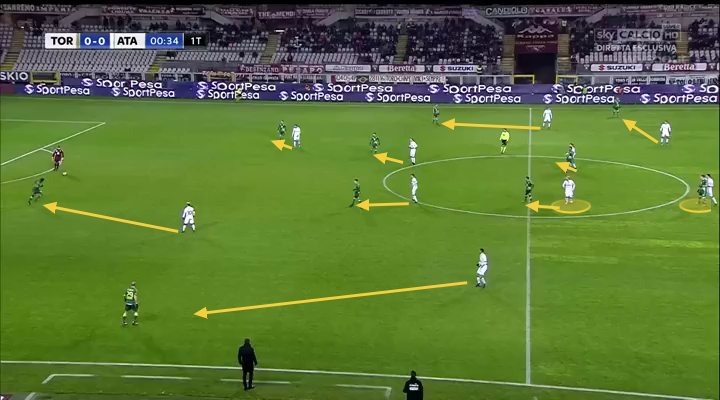 Ilicic presence in this position caused confusion for Torino who struggled to pick up the Slovenian as successfully as they had in the first half. Rincon was either forced out of position or left Ilicic unmarked. Ilicic’ positioning helped Atalanta overload down the right flank before quickly switching the play to Gomez and Spinazzola on the left from where most attacks finished. There was one exception though; the equalising goal. I’ve split it up into two images. In the first one, below, Ilicic has drifted to the right where he and Hateboer is 2 vs 2 against their opponents. Cristante makes a great run into depth which will create space centrally as Obi goes with his run. The ball has now been moved centrally to Toloi. We see how Cristante and Obi are coming back from their previous runs. Ilicic has now moved into the space behind Rincon who is ball-watching. Toloi and Petagna combine before the striker flicks the ball through to Ilicic who finishes emphatically. A superb third man combination to play Ilicic through on goal, and poor defending from Torino. In the end, the game finished 1-1 after Atalanta were robbed of a penalty late on. The second half was more open and exciting than the first had been, but Atalanta should be disappointed with only a point after dominating the second half. It was a good contest though were both sides struggled against their opponents man-marking schemes but occasionally found ways to break through them. To be fair though, the game won’t live on in memory.